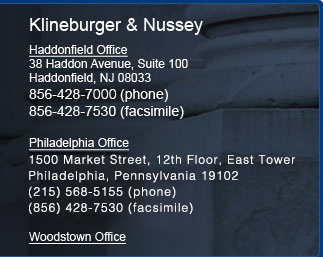 To schedule an initial consultation with an experienced lawyer who will work diligently in representing your legal rights and pursuing your best interests, please contact the law firm of Klineburger & Nussey. From law offices in Haddonfield, New Jersey, and Philadelphia, Pennsylvania, we provide tenacious and thorough representation in the practice areas of criminal defense, family law, and civil litigation. Our attorneys take pride in their ability to fully meet the legal needs of clients - from individuals to families to large companies. Our law firm accepts all major credit cards and we are available after-hours by appointment, including evenings and weekends.